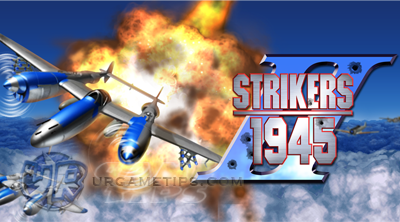 STRIKERS 1945-2 is a classic action and arcade shooting game presented by mobirix. Available on Android - Google Play. Start your engines and play the game in single player mode for a classic arcade experience, or join the interactive multiplayer mode to compete with other players from all over the world! - Before anything else, I suggest that you tweak some settings first to be more comfortable while playing. - I recommend using the Pad control option for controlling your combat plane, so that your free hand can quickly tap on the Super Shot or Bomb button whenever it's needed. - Adjust the sensitivity according to your liking. - Collect Power Ups to increase your fire power and to level up your Gauge Lvl. Gauge Lvl determines your Power Shot's effect, see Power Shots section below for more info. - Every combat planes have their own unique auto-attacks, fire range, and support fire like homing missiles to mini auto-attacking planes. - Collect and use Bomb if you think you can't escape a wide range attack, this will auto-maneuver your plane to dodge all incoming attacks. - It will also call other planes to defend your 12 o'clock for a brief amount of time, very useful for boss fights, where they can rain down heavy "fire bullets". - All combat planes have their own unique bomb effects, the duration and damage output also varies per plane. - Optional: If you are out of Bombs, you can use more by using Gold but it is only limited to 2 Bombs (300 Gold and 500 Gold). - "Super Shot" button: shoots a super shot by using the accumulated power gauge shown at the top of the screen. Higher Lvl will generate greater effects when used: Green (Lv.1), Yellow (Lv.2), and Red (Lv.3). - At Lv.3, using Super Shots will also add explosions where even "fire bullets" will be destroyed! - All combat planes have their own unique Super Shot effects. - Gold Coins isn't really a problem here unless you are a heavy "Partner" user. - Crate icon at the lower right corner of start screen. - Claim once a day, you can get at least 1,000 Gold Coins here. - Play Single Player Mode without using Boosters or Partners. Any difficulty will do, your choice. - Do not use the "?" plane selection, it will cost you 1,000 Gold Coins, unless you really want to. - Single Player Mode, get what you can, or via Points milestone rewards. - See Points section below for more info. - Points are used to claim more Rubies, see daily ruby rewards in-game for more info. - Complete stages from the single player mode, but playing multiplayer mode online will generate more Points per flight battle (1 stage only, so it's faster). 5 Points for the 1st place, and 1 Point for the 4th placer. - Really up to your personal performance, just keep playing and you'll get use to it. - Always stay below the half area of the screen, and keep moving to the sides. Example: Moving to left side will lure all attackers to focus their "fire bullets" to the left side, this will make the right side free from most of their attacks. Move to the right then repeat the idea. - Always watch your plane and ignore your targets while dodging. - To dodge well, match the speeds of the "fire bullets", if it's slow, go slow. If you are still moving too fast, adjust the sensitivity from the settings menu to a lower value. Sometimes, if you move fast enough, small "fire bullets" can be ignored even if you touch them, might be a bug though. - Dodging is the key to win this game, but if it all fails, use your Bomb to save you from an incoming enemy barrage. - At higher difficulties, enemy planes will fire more and will rain down faster than easier difficulties. - Use Boost (2,000 Gold), but make sure to at least get 200 Gold per flight battle to retrieve what you spent. - Using a partner is optional, get one if you are aiming for getting high scores. - Collect Points and Rubies that you can. The more you play, the further you will eventually get, since you are learning the moves of your enemies. - If you think you are confident enough to fight all or most of the stages, you might want to set some High Scores. - First, you need to get a nice plane, unlock them using Rubies then proceed. - Farm enough Gold Coins then use a Booster and a Partner. - Select the highest difficulty stage that you can play with comfortably. - Collect Super-ups and Bombs, destroy as many enemies that you can for more Scores. - Prioritize easy to destroy attackers like sentries and tanks to minimize their firing power, lesser "fire bullets" to dodge. Next, go for the tough ones that can fire lots of "fire bullets". - Collect all "Score bars" (dropped by destroyed enemies) to increase your High Scores, but be careful though. - Use your Super Shots or Bombs wisely, probably vs bosses or tough enemies. Charge your Gauge Lvl to Lvl 2 at least before using it. - If you are out of Bombs, you can use more by using Gold but it is only limited to 2 Bombs (300 Gold and 500 Gold). - See and follow the Dodging Bullets section above. - Avoid clashing into enemy combat planes because your power and gauge will be reduced, ground attackers are ok though. - If you get hit, you have a brief time of immunity, use this to collect lost Power-ups. - If you hit a game over, continue the game by spending Gold Coins! - The best place to get Points, well it's all about Points anyway and Scores for Leaderboards. - Farm Points here to unlock more Planes. - Using a Booster is optional here but using one will greatly help you get 1st place. Some players though would just stay still even if they place 4th, they are just there to farm Points. - Avoid getting hits!, looks like this one can really pull you down from the ranks. - By default, Bombs are not given here, so either catch one, or use your Gold Coins (optional). - Ranks are determined by Scores. See the "Getting High Scores for Leaderboards" section for more ideas, especially the during combat tips. If you have discovered an awesome STRIKERS 1945-2 tip, trick, or strategy, feel free to share them here too by using the comment section below this guide, thanks for helping other players!